I love body moistursiers but I always struggle to find one that doesn't leave my skin feeling sticky or greasy, I want to be able to put my clothes on or go to bed straight away. I haven't had a problem with this one by Lovea as it's a body milk therefore having a lighter consistency but still hydrates the skin very well. It soaks in straight away leaving your skin really smooth and silky. 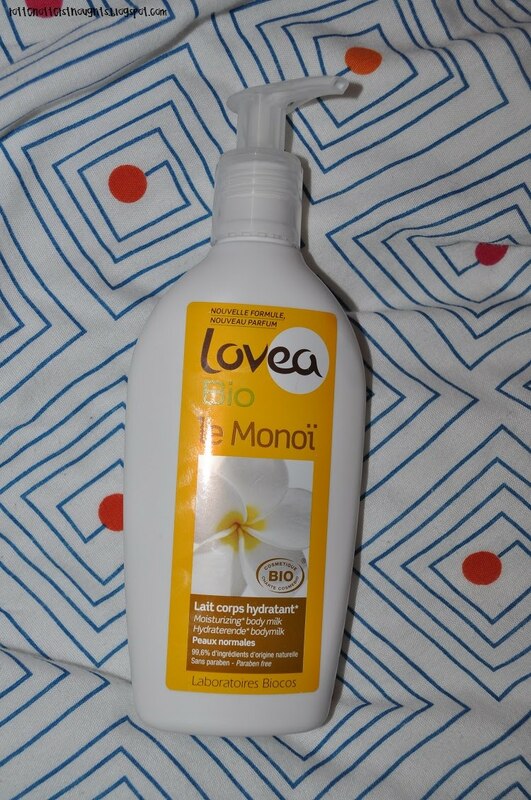 This smells just like the shampoo from Lovea which I reviewed here. I still can't place the scent, something that I've read in a lot of other reviews by bloggers who have reviewed this as well. It's perfect for summer though! Packaging wise it's a bit boring but I love that is has a pump so you can use just the right amount of product and no wastage. I find that two pumps is the perfect amount for one leg. For only £6.99 I'd definitely buy it again and I think I'll be trying the Burkina shea butter lotion for dry skin in the winter can be found here. You can read more about this product here. Disclaimer: I was sent this to review as part of a bloggers panel for Mypure.co.uk, this will not and has not influenced my opinion on this product. All my reviews are honest.